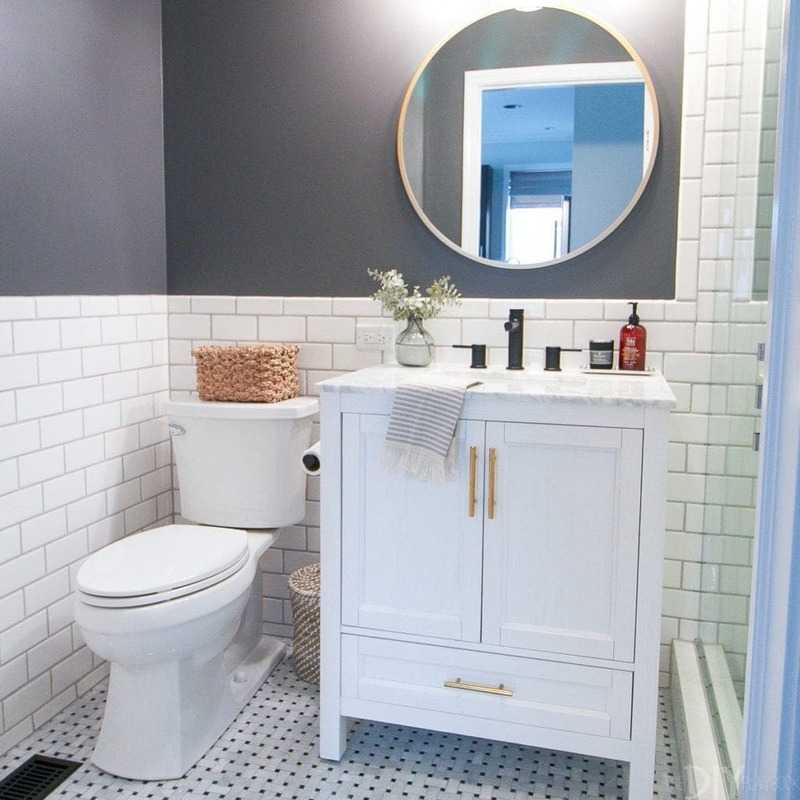 Thank you so much for the love on last week’s bathroom renovation reveal. I’m so happy you guys enjoyed seeing the entire process from start to finish. It was time-consuming and a hell of a lot of work, but every time I walk into this space I am filled with so much pride. Plus, now Finn and I can say “we did that!” whenever guests come over. Oh, what a feeling! 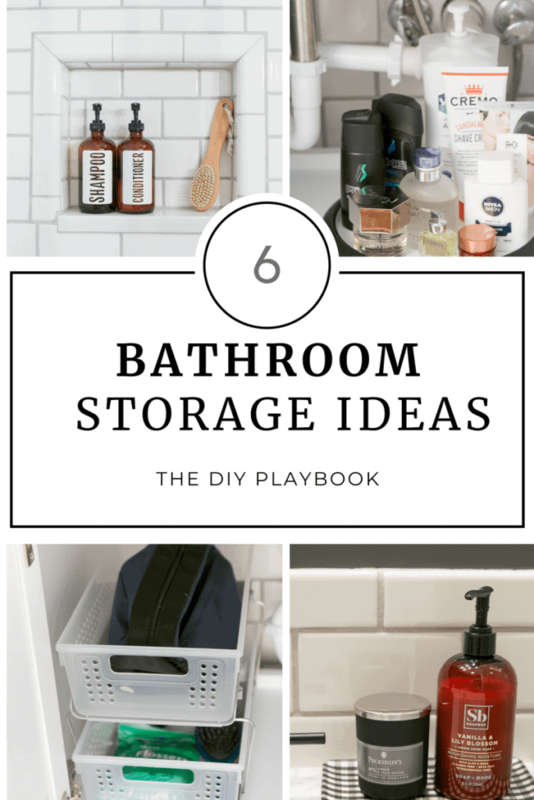 Today, I want to give you guys a peek inside the bathroom vanity and discuss the storage solutions we use in here to make the most of every square inch. Obviously, it’s a super small room, but we actually fit a ton of stuff (mostly all of Finn’s toiletries and bathroom supplies). 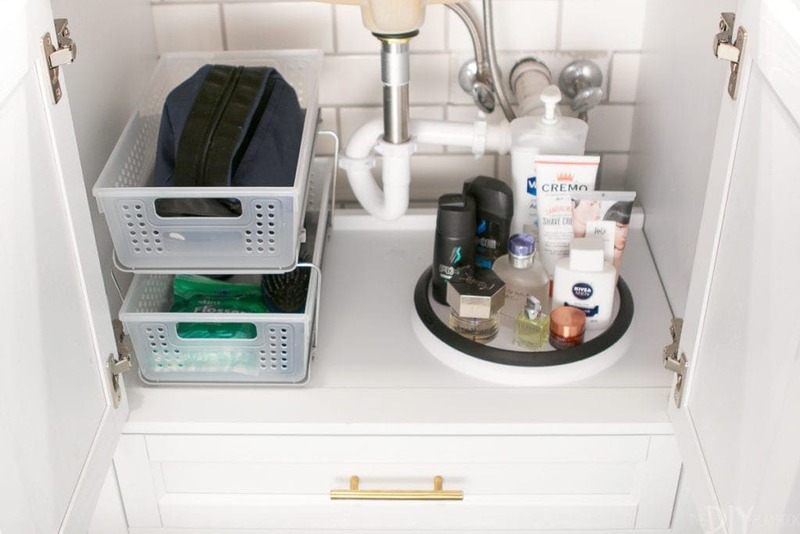 Finn and I got creative coming up with storage solutions to utilize every nook and cranny of the vanity and I’m excited to share our ideas with you guys! A few weeks ago, Finn and I hit up Lowe’s to buy a few things to organize his bathroom space. It was nice to not have to fill up our cart with thinset mortar or more DIY supplies, but instead to have fun in the organization aisle. Here’s what we bought to corral the clutter in here from the start! I’ve seen a lazy susan used before to organize cabinets, but I’ve never used one in my own home. Holy smokes, what a gamechanger. 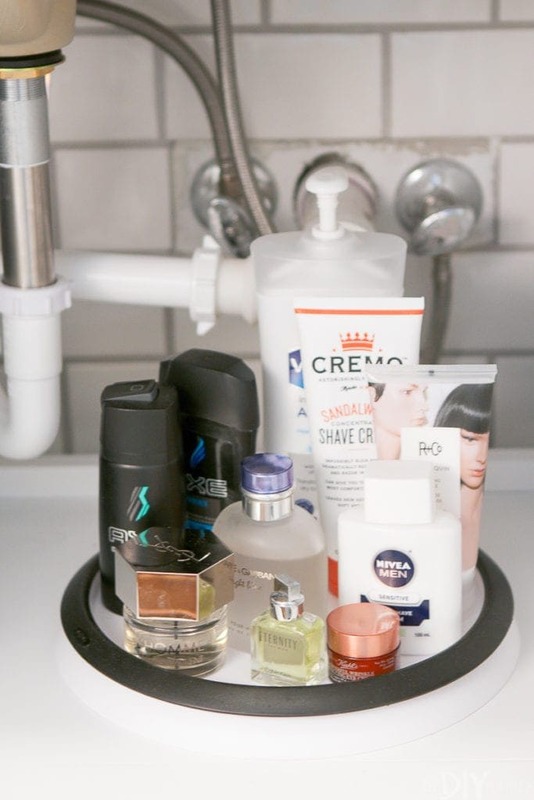 Finn is using this on one side of his vanity for a lot of his toiletries. It’s so nice because each item stays gripped to the bottom of the circular disk, and he can easily rotate it to access whatever he needs. I may be buying more of these for other cabinets in our home. Genius! 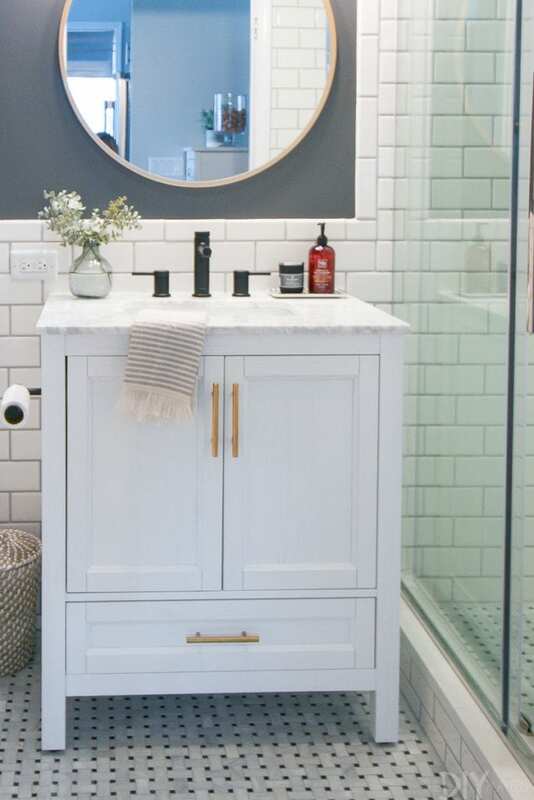 The vanity cabinet in here is pretty tall and we wanted to make sure we were using the space wisely. 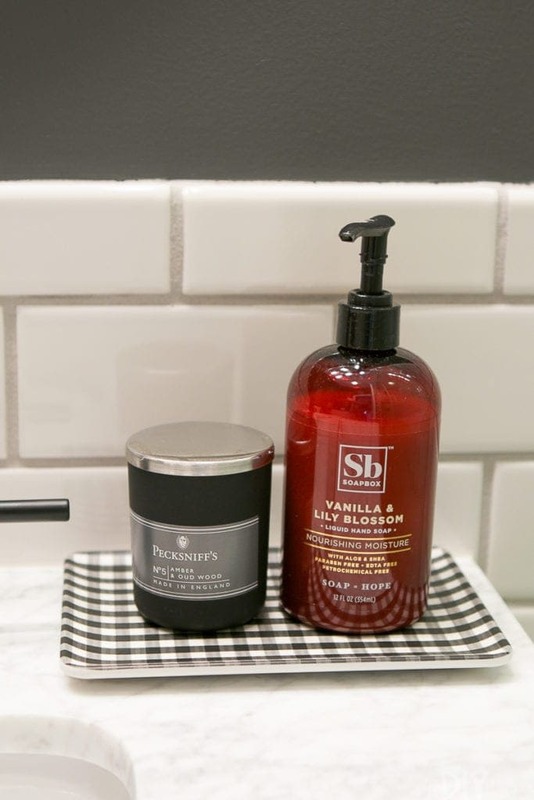 When we saw this double-decker bin, we knew it would be perfect for smaller toiletries and bath items. 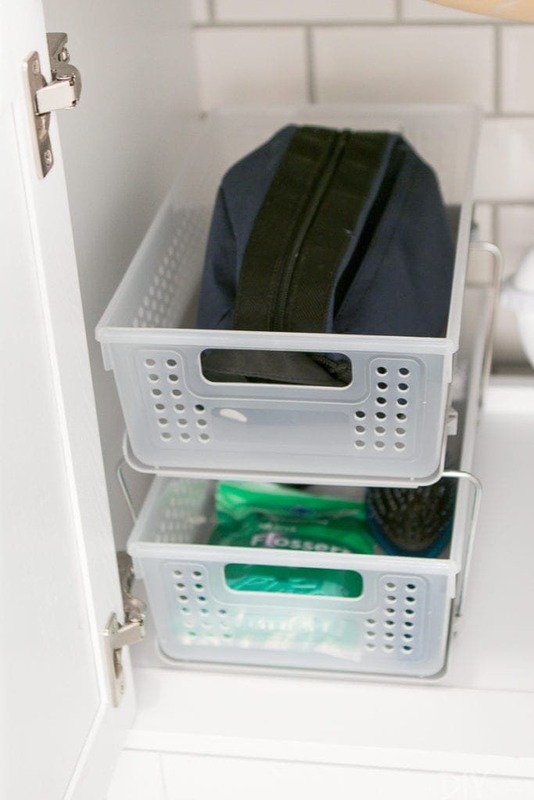 Instead of just having one tall basket under here that’s bound to get disorganized quickly, Finn uses these 2 slide-out bins to corral his stuff. Our last bathroom vanity didn’t have a drawer and I think Finn was pretty pumped when he saw that our new one would have a slim drawer on the bottom. To keep this area looking good, we bought a silverware organizer and plopped it right in here! 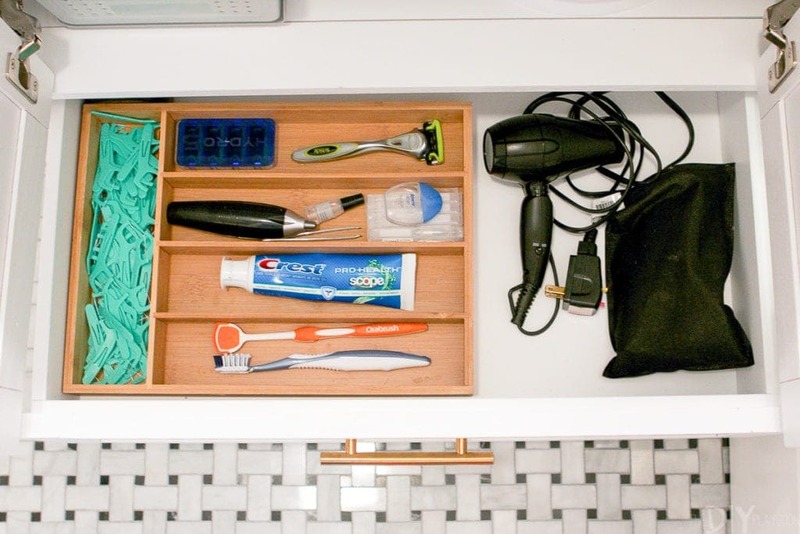 This holds small items like flossers, tweezers, and razors. It’s so much better than just haphazardly throwing items in this drawer. Now they don’t shift around and everything has its own compartment. 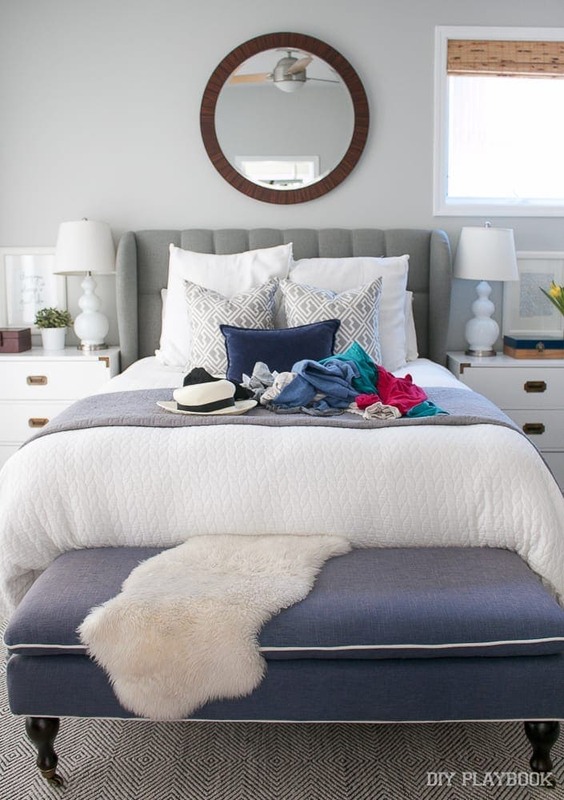 When it comes to storage, we’re all about “secret storage.” Basically, hiding items so you don’t have the visual clutter. 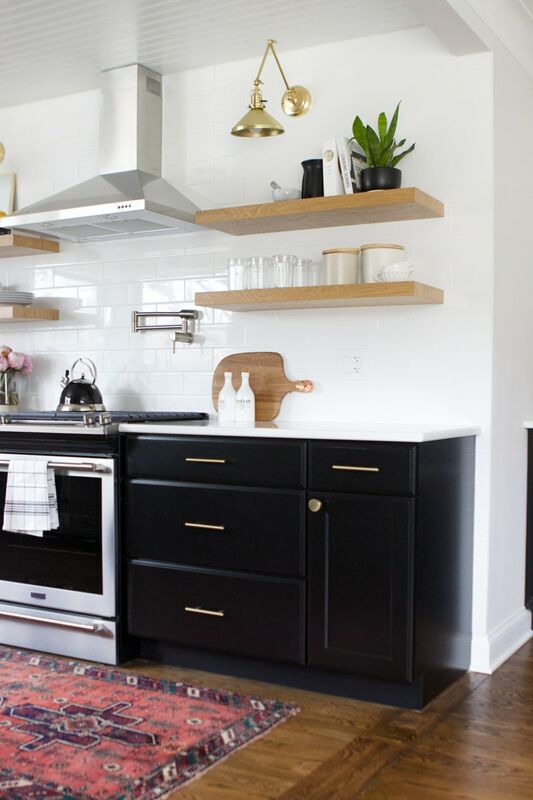 Because I want the pretty tile and other bathroom elements to shine in here, I really didn’t want to display too much on the countertops. I did pick up this cute little tray though and I added a soap dispenser and candle to it. Finn always likes to have a small tray in here to hold his watch and wedding ring when he showers, so this one worked perfectly because it’s so petite. 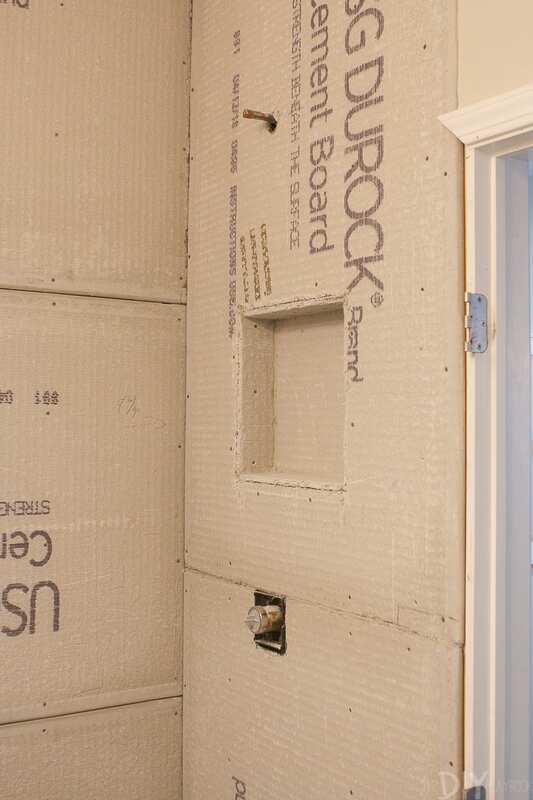 Now that our shower curtain is gone and we have large glass doors, you can see directly into the shower. The last thing I want is for ugly shampoo and conditioner bottles to be on display for all to see. So, I ordered these adorable containers from Etsy to hold Finn’s shampoo and conditioner. 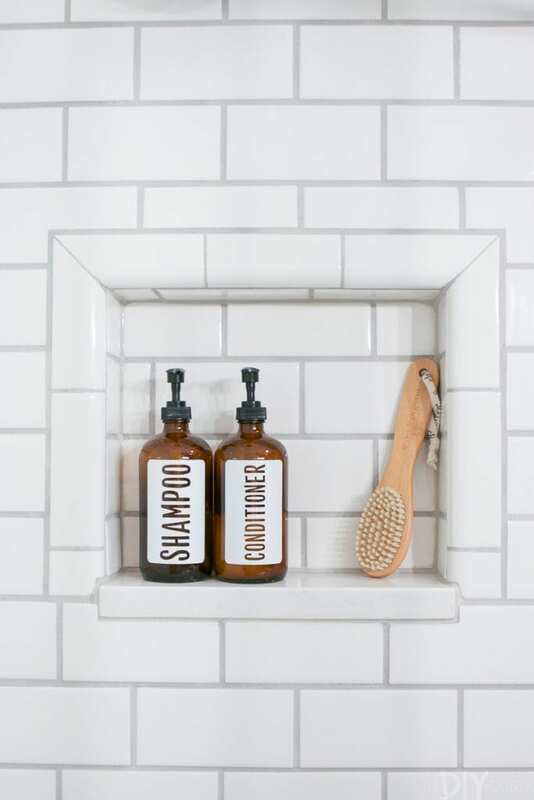 It only takes a few minutes to fill them up with his shower essentials, and no one needs to see the ugly bottles. 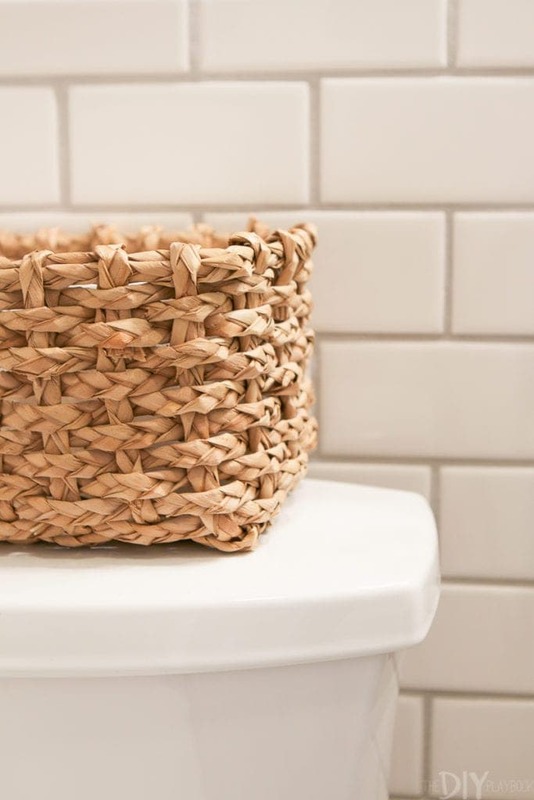 Extra toilet paper is a must for any bathroom space, but especially a guest bathroom. 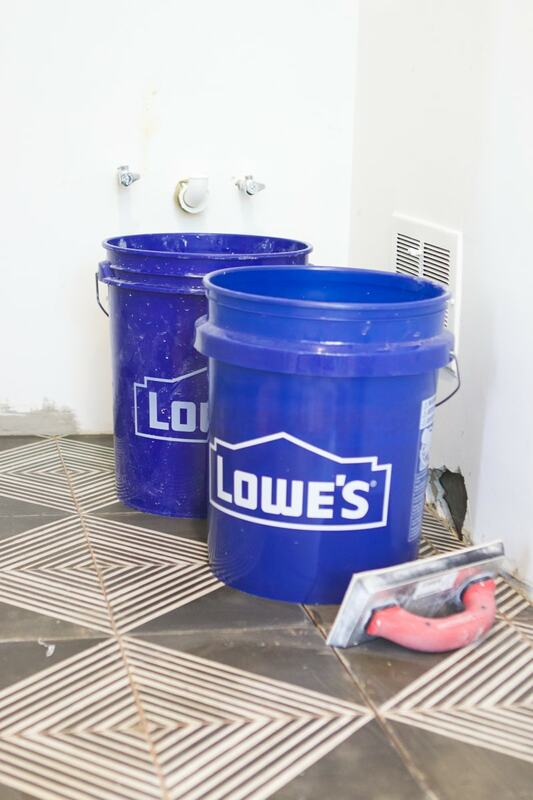 You don’t want guests to run out of toilet paper and have to ask you for more. That’s why I like to keep extra toilet paper on display and easily accessible to everyone. Plus, maybe it will encourage that husband of mine to always change the roll when it’s empty. A girl can dream, right?! 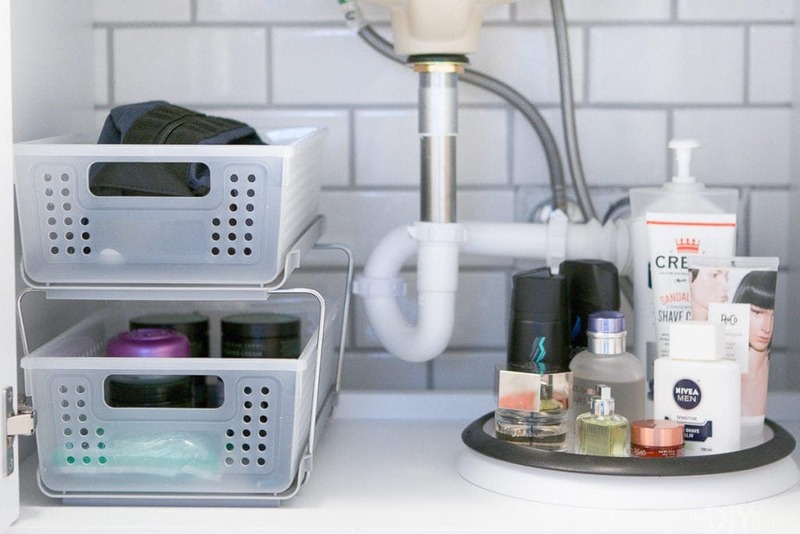 It may not be the largest bathroom, but it certainly works for us and these storage solutions help to keep this space organized and running smoothly.